To raise the head restraint, pull it upwards. 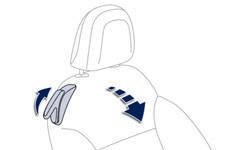 The adjustment is correct when the upper edge of the head restraint is level with the top of the head. Never drive with the head restraints removed; they must be in place and adjusted correctly. Pull only this control upwards to fold the seat back and move the seat forward. When put back in place, the seat returns to its initial position. 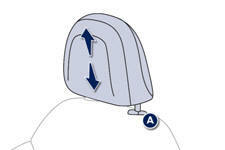 Ensure that no person or object prevents the seat slide from returning to its initial position; the return to this position is necessary for longitudinal locking. Check that the seat belt has reeled in correctly so as to not impede access for passengers to the rear seats.